I know I keep harping on this subject. Not sure why, except that it fascinates me. that echoes my post on this topic from just a couple days ago. 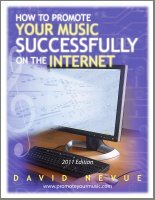 Just released the 10th edition of the Indie Bible by David Wimble. The bleeding at Sirius XM continues... down to .16 cents a share. An all-time low for the company. Here's the thing... we don't really need to Satellite radio anymore. As "plugged-in" as people are these days, we tune into whatever we want whenever we want without the commercials. We can listen to our own song selections, anytime. We don't need to be "force fed" our music. We are no longer cattle being led to the musical trough. A music listening experience is not a one-way event anymore. It's interactive. We choose/make our own "radio." Granted, I sometimes enjoy popping on the 80's channel and going down memory lane, hearing tunes I hadn't thought about for a very long time. Even so, a good third of the songs I hear on the cookie cutter channels are obscure tunes that I could care less about. If only I had a "skip" button on Sirius XM like I do with Pandora. Oh, Pandora, how I love thee. Here's what I see happening... within the next five years our cities are going to become even more wired. The time will come, and is already coming, where you can go anywhere and be wired into the Internet - even so far as to be wired in your car as you're on the road driving from city to city. Pretty soon, high-speed wireless will be as common as cell phone reception, maybe even more common. And then we'll be able to tune into our favorite Internet radio stations, be they Live365, Pandora, or the custom playlists we created on MySpace or Facebook anytime we want. Or we'll plug in our iPods, or Zune, or whatever. Here's the problem for Sirius XM - while it got into the Satellite radio game on time, it charged more than people were willing to pay for a subscription... and people aren't willing to pay very much... which is why the model has failed. People don't want to pay for music they don't entirely control. If subscribers are going to pay for music, they want it entirely, 100% on their own terms. Music is no longer passive, it's active, changing, exciting, moving, aggressive... and we, the people, are in control. Music is one of the few things we truly have freedom of choice over as individuals. We listen to what we want, when we want, and how often we want. Music is anarchy. And it is love. And it is passion. And our choice of music makes us feel like there is at least one thing in this crazy world that we can control. And right now, I want to listen to "Grace Under Pressure" by Rush.